(CNN) -- Australia batted themselves into a strong position on the opening day of the second Test in Durban with openers Phillip Hughes and Simon Katich both hitting centuries on Friday. 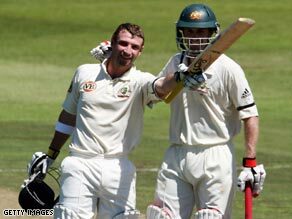 Hughes (left) and Katich (right) shared a 184-run opening stand to put Australia firmly in control in Durban. The pair forged a magnificent opening stand of 184 as the tourists look to extend their series lead after winning the opening Test in Johannesburg last week. South Africa briefly rallied as Hughes (115) and Ricky Ponting for just nine went in quick succession in the afternoon session. Katich completed his century before becoming Dale Steyn's first victim for 108, with Michael Clarke dismissed for just three as he was bowled by left-arm spinner Paul Harris, who had earlier had Ponting caught off an attempted drive. But Michael Hussey was unbeaten on 37 by the close with Marcus North on 17 as the Australians ended on 303 for the loss of just four wickets. Hughes, who made a fine impression on his debut in the first Test, dominated his opening partnership with the more experienced Katich, hitting six boundaries in Morne Morkel's first two overs. He scored 19 fours and two sixes as he reached his maiden Test century before falling to South African all-rounder Jacques Kallis. Australia went into the series having lost to South Africa at home and in danger of losing their status as the world's top-ranked Test playing nation. Fielding an inexperienced team, Ponting's men played superbly at the Wanderers and could bat South Africa out of the match on the second day. Before the match started, both sides paid respect to the victims of the terror attacks in Lahore earlier this week.